A search is under way for a GP from Peterborough who is missing, feared dead, after a hike in the French Alps. 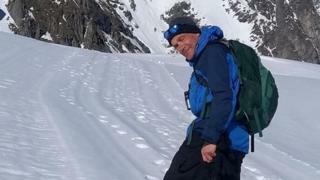 Robert Bailey, 63, has not been seen since he went out walking in Les Houches, near Chamonix, on 22 March. The area, at the foot of France's highest peak, Mont Blanc, lies on the border with Switzerland and Italy, and is popular with skiers and climbers. The Foreign and Commonwealth Office confirmed it was in contact with the French authorities. In a missing persons notice published on social media, the mountain rescue Gendarmerie in the resort said Dr Bailey disappeared on Friday after going hiking. As reported in the Peterborough Telegraph, Dr Bailey is a senior partner at Minster Medical Practice in Princes Street, Peterborough. A recorded message for callers advises patients to make emergency appointments only "at this difficult time". "We are extremely saddened to advise that Dr Bailey, who was on holiday in Chamonix, was involved in an accident last Thursday," the message says. "At present we have no further information." Dr Bailey is also the clinical lead for end of life care at the Peterborough & Cambridgeshire Clinical Commissioning Group (CCG). The CCG's clinical chair, Dr Gary Howsam, said: "Everyone who knows Rob Bailey will be incredibly worried and saddened by this news." The Planet Chamonix website is reporting that Dr Bailey "did not come back to his hotel after setting out on a hike up the Col de Forclaz, Les Houches." It says he is wearing a blue jacket, dark pants and a green back pack.